What if you and your fiancé have decided that you definitely want to have a destination wedding but you're not entirely sure where? How do you begin planning your wedding? Simple Answer: You can't begin planning a wedding until you have definitely decided exactly where you want to get married. 1. Cold weather or hot weather? A mountain top or a beach? Fall leaves or aqua seas? Figure out what time of year you're getting married and what kind of optimal weather you'd like to have on your wedding weekend. 2. Passports required or not? Do all of your guests have passports or will this become a nuisance factor that prevents many of your guests from accepting the invitation? While you don't have to poll your guest list, you should have some idea as to how well-traveled they are. When it doubt, think Puerto Rico or the U.S. Virgin islands if you want a tropical destination wedding. No passports required in those destination for U.S. citizens. 3. Do you need to have handicap accessibility at your wedding venue? There are great historic estates and amazing island villas that are wholly inappropriate venues if you have somebody in an electric wheelchair attending who cannot be easily lifted up a short staircase. Historic buildings and venues outside the continental United States may not meet ADA standards so you have to do your research based on your guests' needs. 4. Are you concerned about your guests' budgets? All-inclusive resorts may sound easy, but really, they're only affordable to the bride and groom because they place the cost obligation on the guests who attend your big day. Everybody is paying for all their own food and beverage, you're just dictating what they get to eat at your specific events. Some of your guests may want to stay at a different hotel or event rent a house, so you have to factor in how that affects your all-inclusive wedding package. Also, there may be multiple weddings going on the same day or weekend at that resort. Do you care? 5. How private or public do you want your wedding ceremony and reception to be? Many historic landmarks can be rented for ceremonies, but they don't shut down the property to the general public. The same with parks, beaches and many hotels. If you want to get married in a field with nobody but your nearest and dearest, make sure you're using private property or can obtain a permit for a private event. Make sure your hotel has a reception venue space that isn't in the middle of the general hotel chaos — it's weird to have people in wet bathing suits or bathrobes walking through the background of all your candid photos. Brides have plenty to worry about the week of their wedding, but if you're a bit of a hypochondriac (like some over us here, oops) you can also add staying healthy to your list of concerns. To calm your worrying mind, here are five ways to make sure your maintain your health the week of the wedding. We also suggest that you just stay off WebMD... forever... for all of our sakes. Salmonella poisoning, while not common, is a real thing. If you're truly concerned about maintaining tip-top health, avoid raw fish, eggs, and meat the week of your wedding. You probably would have been fine eating that steak tartar or tuna sashimi, but with an event as big as your wedding coming up, why risk it? Stress is not only mentally taxing, it also weakens your immune system. To keep your immunity high, get as much as possible done well in advance of the week of the wedding. We know, it's easier said than done and last minute issues will come up, but your body will appreciate the forethought. Proactively counteract stress by upping your intake of vitamins in the weeks leading up to your wedding. Incorporate foods rich in Vitamin C — like bell peppers, citrus, or broccoli — into your diet to prevent colds. Also consider taking Vitamin C, Vitamin A, Garlic, or Zinc supplements, as all are said to prevent illness and up your immunity. Catching your zzzz's is a crucial part of staying healthy. Sleep not only boosts your immune system, it also keeps your skin glowing, your mood pleasant, and your mind sharp — all essentials in our book. If wedding planning has your mind too scrambled to sleep, consider taking a natural melatonin supplement to help you doze off. Style blogger Kim Pesch is the mastermind of eat.sleep.wear. She writes daily posts about her favorite fashion finds, and is a social media powerhouse when it comes to sharing photos of her inspiration. Naturally, Kim started thinking about her wedding dress almost immediately after she got engaged to her fiancé, Blake Lapides. Luckily for us, she decided to share her journey toward finding the dress — a major task for a trendsetter! Kim brought along photographer Alison Conklin as she went to appointments and shared with us her favorite dresses — as well as some fashion insight — from the fun day. Check out our favorite snapshots from her Instagram takeover, and get some exclusive details on her upcoming wedding! For us, the obvious highlight of the dress-shopping day was the gorgeous details that she shared with us. But for Kim, the entire experience was a lesson in remaining open-minded. "It was about letting go and trying on as many styles as possible. Even if I thought they might not suit my body type or I might not think they were 'my style,'" she tells us. "I think if you have an open mind going into your dress shopping, you might surprise yourself by what you like, what looks great. Because at the end of the day, you want to look and feel your best and with that big smile on your face, it's going to be hard for everyone not to be staring." One person who will definitely be staring? Her proud fiancé, whom she happily says is letting her plan the wedding of her dreams. As for the type of wedding dress he'd like to see her in? "Not a princess gown," Kim says. "I know he would love to see the beautiful woman that he sees me as and that means showing a bit of my shape with a more form fitting dress." Kim and Blake are planning an outdoor, coastal wedding, which is informing nearly everything about her details — except for the dress! "I wish I could blurt out where it is but it's a truly special and beautiful place," she told us of the secret spot. "Filled with lush palms and greens tones and set on the ocean. It will be an elegant garden party ... with lots of pineapples." Though that sounds like the recipe for a flowy, garden-party appropriate wedding dress, she insists that that's not the case. "I didn't let the location dictate my style. 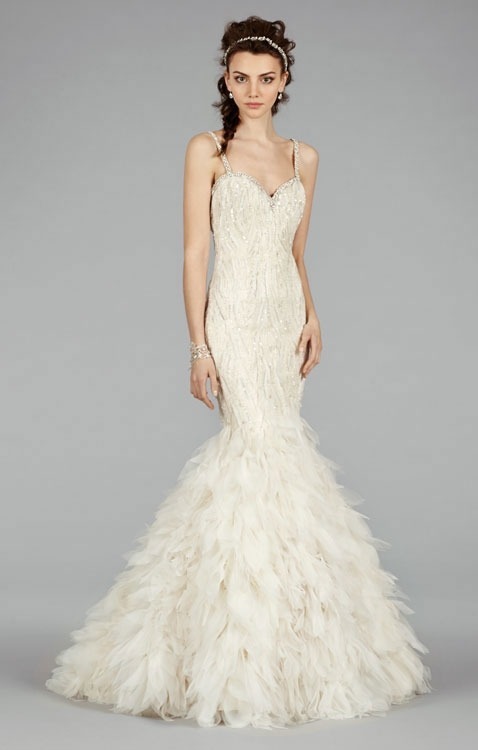 I am getting married once, and I will wear the dress that I fell in love with. It has a modern twist to it. And I am obsessed with the neckline," she added. The self-described "Pinterest obsessed" bride-to-be is keeping the rest of her wedding details under wraps for now, though she does admit to loving Lauren Conrad's rustic, romantic wedding. "I loved that she stayed true to her style and nothing was over done," Kim explains. "I think that is one of the more important things I have on my mind as I am making all these decisions. Keep true to myself, and keep it chic but simple." As for her fiancé, he might have a hurdle to jump in that regard. "He is very involved in what he wants to wear," Kim says lovingly. "He will definitely be wearing a tux. In a perfect world, he would love to style an ode to Humphrey Bogart with a crisp white tuxedo jacket. We shall see about that." Whether or not he gets his dream tux, Kim is positive that their wedding will be an absolute dream come true. "To be in the moment," is how she describes her ideal state of mind for her nuptials. "I am having a very intimate gathering so I can take everything in and really just have the best time celebrating with the people that I love." If you're looking for a standout venue for your destination wedding, it's time to give a castle some serious consideration. Aside from the obvious draws — hello, you can get married in a castle — there are tons of logistical reasons why it's worth checking out a turreted locale for your nuptials. With tons of space to house your guests, a gorgeous backdrop for your vows, and lots of local history to absorb, these beautiful castles are the perfect way to truly feel like the king and queen on your big day. We're spotlighting three amazing destinations for your fairytale "I dos!" Why here: Ashford is a castle, seen above, with a capital C, with a glittering lake, endless lawns, and major historic cred. (It was built by the de Burgo family in 1228.) And with 83 guest rooms, it's the right size for a buyout. Where to wed: Get married in one of two churches or in the walled Victorian gardens, then do diner in the lakeview dining room. Insider tip: Ashford offers archery and falconry lessons for any members of your party who want to pick up new skills. Why here: The official home of Hawaiian royalty until 1893, America's only actual palace remains sacred ground to locals. Where to wed: Get hitched in the courtyard of the old military barracks or on the lawn of Coronation Pavilion, where King Kalãkaua and Queen Lil'uokalani were crowned. Insider tip: You can't get married inside, but you can arrange for guests to take tours of the palace's galleries, where the royal family's crown jewels are displayed. Why here: Built in 1893, this storybook resort in the walls of the old city just emerged from a $75 million renovation. Where to wed: Take your first dance under the chandeliers of the huge Grand Ballroom in front of up to 1,000 of your closets friends. Insider tip: Organize a cable-car trip to the top of Montmorency Falls. The views of the St. Lawrence River and Île d'Orléans are mind-blowing. Keep this in mind if you do settle on a castle, though: Many castles, particularly in Europe, don't have the 21st-century amenities we're used to — like heating. Find out exactly what you'll need to bring in before signing on the dotted line. George Clooney wasn't the only celeb to recently wed in Italy — Neil Patrick Harris married longtime love of ten years David Burtka earlier this September in Perugia. And, thankfully for us, he divulged even more big-day details on the Late Show with David Letterman. "We wanted to do a destination wedding, our first trip together was in Italy so that seemed fun, and then, in the beginning of the year, a friend of a friend knew a dude who had a castle," Patrick Harris hilariously explained. "So we were like 'Oh hey that's fun!'" At their destination ceremony and reception was an intimate group of 50 people, including close friend Sir Elton John. Excitedly, Patrick Harris says the music legend also announced their first dance — which was to the tune of "A Moment Like This" by Kelly Clarkson. "That was always kind of our song," Patrick Harris explained of the selection, because, he says that he and Burtka were "Team Kelly" from the beginning of American Idol. But, according to the actor, like his famed How I Met Your Mother character Barney Stinson, he had a few tricks up his sleeve. "I love games and puzzles and stuff, so it was all these surprises, no one kind of knew what was happening as it was going on," Patrick Harris said of his sweet celebration. "We started dancing to ["A Moment Like This"] and we had a plan: We had a firework guy, who, when the song crescendos, fireworks were supposed to go off." But, because they were in a small town in Italy, Patrick Harris didn't have faith that it would occur "at 2:27 like at Disneyland." To his delight, "It happened perfectly." After showing a few snaps from that spectacular moment, Letterman and Patrick Harris said together: "Take that, Clooney!" Watch the entire interview, above! If you're entering into your second marriage, there may be things you are totally sure about — like your choice of groom! But there may be things that you wonder whether you can repeat, get away with or should even consider doing. And if that's the case, we're here to answer five questions that are likely giving you pause. Is it alright to have a big church wedding? "If it's all right with you, your groom and the church, by all means," says etiquette expert Diane Gottsman. "While in the past second weddings have usually been smaller, more discreet affairs, there is no rule preventing you from a bigger, more traditional wedding if this is your preference." If you didn't get your large, elegant affair the first time around, this is your chance! Of course, this could be your groom's first wedding, too, and he may want the whole she-bang. "Ivory is a good option," suggests Gottsman, "but white is not out of the question these days. It's entirely up to the bride." Should the bride have another wedding shower? "For a second wedding, a shower is more about celebrating the impending nuptials rather than giving the bride things she'll need for her new married life," says Gottsman. "Again, follow the bride's wishes; some second-time brides prefer to keep things low-key, some want to go all out." If you don't want a traditional shower, consider other ways to mark the occasion, such as a lunch or spa day with friends, a gift-free recipe shower, or even a co-ed couple's party. If you are close friends with your ex or his or her family, should they be invited? "The right answer here can only come from a conversation between the bride and groom," says Gottsman. "If you all have a good relationship and the new spouse is in truly favor of — and not just tolerant of — inviting the previous one or his family, by all means, invite them." We have everything we need for our household; can we ask for money? "Some people opt to set up honeymoon funds, or some other type of monetary gift, however, the best choice when soliciting monetary gifts, or any other specific gift is to communicate your wish to family members or close friends so that they can answer questions from other guests," suggests Gottsman. But just know that "there will always be guests who prefer to give a wrapped present, not cash and those that prefer the opposite." NBC Sports's Josh Elliott and Eyewitness News's Liz Cho Are Engaged! Separate networks couldn't keep these two anchors apart: Eyewitness News's Liz Cho and NBC Sports's Josh Elliott are engaged! According to the New York Daily News, the two TV vets — Elliott is known for his time on ABC's Good Morning America, and various spots on ESPN — got engaged while on vacation in Europe this past summer and have kept quiet since. Page Six reports that the proposal was "spur of the moment." "He gave her a simple gold band that was a family heirloom and meant a lot to him," a source says. "It's been very low-key, and people may not have even realized she was engaged, because she's not wearing a standard diamond engagement ring." The insider adds: "They had been so discreet about the engagement, they have just started revealing the news to close family and friends. And while sources close to the couple confirmed their pending wedding, it was Elliott's former colleague, Sam Champion, who first broke the news via Twitter. "Im not going to b at work tomorrow. @JoshElliott32 and @LizCho7 announced their engagement tnite!!" the weatherman tweeted. He also posted a photo of a large group celebrating the exciting news, including newlywed Katie Couric. This will be the second marriage for both Elliott and Cho who each have children from their previous marriages. They've together since 2012, once Cho called it quits with her first husband Evan Gottlieb. Both the bride-to-be and groom-to-be's children reportedly get along. No word yet on the wedding plans, but we're sure it will be small and family-oriented. Read more: NBC Sports's Josh Elliott and Eyewitness News's Liz Cho Are Engaged! We've all been there. You're at a wedding and you've been drinking and dancing for the last three or four hours. The party's winding down and the hunger pangs are setting in and, much to your dismay, you realize you missed dessert and all the slices of cake are gone. Almost in a panic, you're half-considering a fast-food run when suddenly, you spot waiters making their way to the dance floor, carrying trays of sliders and piping-hot french fries. In an instant, it's become the best. wedding. ever. 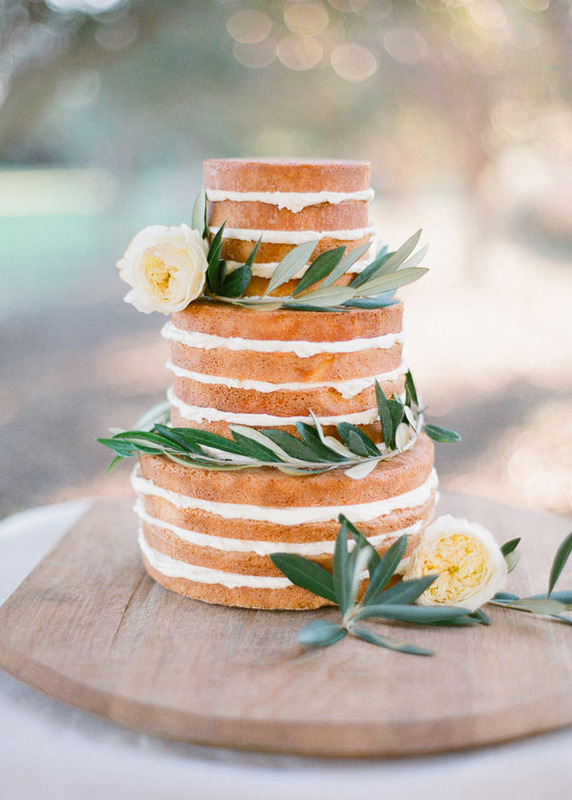 See More: Can I Host a Cake-Only Wedding Reception? When it comes to late-night snacks, think mini. Anything larger would seem too much like an hors d'oeuvres or appetizer. Keep it small—just enough to satisfy without having to use any utensils. 2. Serve something sweet or savory (or one of each!). Have your caterers set up a late-night snack station next to the dance floor or send servers out with trays of treats about an hour or hour and a half before the end of the reception. Since many guests will begin to leave long before the last song is played, you should aim to order enough snacks to feed about half of your guest list. However, this depends on your specific crowd, of course, so if you know most of your guests will stay to the very end, then you'll need to up the quantities. 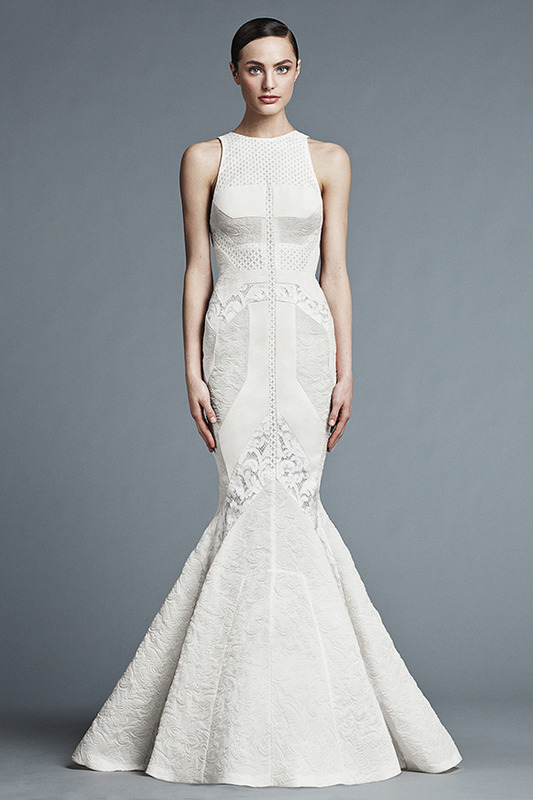 Read more: Get a Look at Amal Alamuddin's Oscar de la Renta Wedding Dress! A whole host of celebrities got married this year and so many of those couples are documenting their newlywed lives on Instagram. From trips abroad to sweet moments spent together, they are giving us glimpses into their everyday lives with each post. Check out these photos from our favorite newlywed celeb couples for a sweet addition to your day. Kim Kardashian and Kanye West: After the most talked about wedding of the year, the selfie queen and rap mogul have finally embarked on married life together. As you might have guessed, it's mighty stylish! From tour stops to vacations in far-flung destinations, the power couple are taking the world by storm. Behati Prinsloo and Adam Levine: Models and musicians have been falling in love since the beginning of time, thus it only makes sense for Behati Prinsloo and Adam Levine to get together and tie the knot. Though we're still waiting for the pair's wedding photos to emerge on the photo sharing site, we love their fun snaps of their red carpet appearances, style choices, and special moments spent with friends. Neil Patrick Harris and David Burtka: As you can see, this couple loves quality time spent with their adorable children! We've all loved Neil Patrick Harris for years, but it's clear that husband David Burtka loves him just a bit more than us Doogie Howser and How I Met Your Mother fans. Family photos and lots of smiles are always present in this twosome's pictures, which brings us all a lot of joy. Jessica Simpson and Eric Johnson: Jessica Simpson, takes pleasure in showing love for her husband, Eric Johnson on the 'gram with sweet family portraits and even a few silly snaps. With two beautiful children already, we cannot wait to see how the newlyweds expand their household. Ted Gibson and Jason Backe: Love beauty? Well, so does this couple! Ted Gibson and Jason Backe are the co-owners of Ted Gibson salons all over the country and do the hair of the world's most gorgeous celebrities. If you love behind the scenes pictures, video, and funny moments, you'll love the musings of this pair. Nate Berkus and Jeremiah Brent: When these two got hitched, we knew it was a match made in interior design heaven. The happy couple loves to travel and frequently posts snaps of themselves at stylish parties: both of which serve as daily inspiration. Olivia Palermo and Johannas Huebl: On the list of the most stylish couples of this decade, our former cover girl Olivia Palermo and Johannes Huebl will definitely be in the top five. They're both incredibly good looking and frequent fashion shows, movie premieres, and red carpet affairs arm in arm — always looking chic. Gabrielle Union and Dwyane Wade: Another sartorially-savvy duo makes our list! Union and Wade had one of the most fashionable weddings of the year and though they've just tied the knot, we've already been following them both on Instagram way before they were engaged. Kaley Cuoco and Ryan Sweeting: The last name "Sweeting" is absolutely befitting of these two as they just cannot get enough of one another — always taking the sweetest and most affectionate snaps. The Big Bang Theory actress and pro tennis player are clearly still madly in love, which gives us all a bit of inspiration. What We're Pinning: Amazing Honeymoon Ideas! Follow BRIDES's board Honeymoons on Pinterest. Let's be honest — the honeymoon is what most grooms (and brides!) look forward to the most during wedding planning. It's where you can sit back, relax, and enjoy each other's company in a location you've probably only dreamt of previously. But first, you have to figure out where to go! As couples get more adventurous with their destinations (African safaris and jungle adventures in Central and South America are becoming wildly popular), the choices can get downright overwhelming. Enter Pinterest. The very same site that likely helped you pick out wedding details is also a hotspot for honeymoon content. We constantly search for wanderlust-inducing photos of far-off destinations where newlyweds can really feel alone, as well as more practical ideas, like where to stay and what to do. Not only are the pictures pretty, but they're a great way to discover that tropical island you'd never heard of but now have to go to. We plucked three of our favorite pins off of our "Honeymoons" board to show you exactly what we mean. Read about them below and don't forget to follow us on Pinterest for more wedding ideas of all kinds! First things first: Where on earth do you go? Generally, couples flock to the same places over and over again — Fiji, Italy, Hawaii, the usuals. This pin, for instance, shows the number-one destination for 2014, French Polynesia. With that picturesque scene taken on its isles, it's no wonder why. Once you pick a destination, it's crucial to find a hotel that you'll enjoy and that will provide the best possible honeymoon experience. This pin leads to a slideshow of the best honeymoon resorts in Asia and Australia. From seaside spas in Thailand to rustic hideaways in New Zealand, it's a goldmine of information that you'll definitely want to pin. Finally, you need to round out your packing list! You'll obviously need cute clothes and maybe a passport, but don't forget that travel and relaxation often entail a good book. That's why this graphic is so great — it's filled with honeymoon-friendly reading material you'll want to check out (if you can steal away time from your new husband, that is!). Read more: What We're Pinning: Amazing Honeymoon Ideas! As you write thank-you notes after your wedding, remember that not all gifts come wrapped in pretty paper! Though most, if not all, guests will surely give you a present from your wedding registry, there are other loved ones who have go above and beyond with support during wedding planning that definitely deserve some extra-special appreciation. The following categories include both gift givers and the people who make a wedding special through their efforts and goodwill. The neighbor who accepts delivery of your gifts when you're at work, the cousin who supervises guest parking at the reception — anyone who assists you during your preparations, the wedding itself, and after the big event should be graciously thanked. It's also nice to send notes to your officiant and anyone else (the organist or music director, for instance) who worked with you on the ceremony, even though you've paid them the customary fee. You don't have to write everyone you hire for services, but anyone who exceeds your expectations will appreciate a courteous note of thanks. When there is more than one host for a shower or party, write to each person or couple. These notes should go out no later than two days after the event. The one exception is when a large number of people in your office or workplace host a shower or party in your honor and give a group gift. While it's preferable to thank everyone with an individual note, it is acceptable to write to the organizer or organizers only. Be sure your note includes your appreciation for everyone's participation. The person who receives your note should forward it to coworkers or post it in a common area. But if individual presents are given, write individual notes. BRIDES Investigates: Did Angelina Jolie Really Gift Brad Pitt a $3 Million Watch for Their Wedding? Ever since their late August wedding, it's impossible not to hear how much Angelina Jolie and Brad Pitt are loving newlywed life. Now, just over a month since the celebrity couple finally tied the knot, we've learned about nearly every detail of their romantic and intimate French countryside wedding. One thing we hadn't heard about, though, was whether or not the new Mr. and Mrs. Pitt exchanged gifts to commemorate the occasion. As of yesterday evening, the rumor mill was churning with news that Angie did, in fact, gift her new husband with an amazing present in honor of their wedding: a coveted, 1952 "JB Champion Observatory" platinum watch, which the Daily Mail reports is worth more than $3 million. According to reports, the rare timepiece from the esteemed Swiss watchmaker Patek Philippe was inscribed with a short love note from Angie to Brad — "To Roly from Nessa," a nod to their characters in their upcoming drama By The Sea. See More: Brad Pitt on His Marriage to Angelina Jolie: "It's More Than Just a Title"
So did Angie really drop a small fortune on a watch for her new husband? We thought the spendy present seemed out of character for the philanthropic actress, so we investigated the story. And it turns out our suspicions were correct: Brad is not the proud new owner of the pricey watch. Forbes is debunking the rumor, saying that while the watch did recently change hands, it was not sold to the high-profile actress. "Only moments ago was this confirmed NOT TRUE, though the watch has indeed been privately sold," Forbes reports. Sorry, Brad, maybe you'll get a rare watch for your first anniversary! Read more: BRIDES Investigates: Did Angelina Jolie Really Gift Brad Pitt a $3 Million Watch for Their Wedding? Exclusive: See Little People, Big World's Jeremy Roloff and Audrey Botti's Entire Wedding Album! Last week, Little People, Big World star Jeremy Roloff wed Audrey Mirabella Botti on his family's farm in Hillsboro, Oregon, and we've got the exclusive photos of their outdoor celebration! Six months after Jeremy popped the question to his girlfriend of three years with a custom-designed engagement ring, the pair made it official, walking down the aisle on September 20th, 2014 at Roloff Farms and celebrating with nearly 300 guests. From the hay bale pews to the mismatched china and everything in between, this one's a stunner. Read on to see all the seriously sweet — and exclusive — details, planned by Mandi Wiley of Champagne Wedding Coordination and gorgeously captured by Christianne Taylor! The creative-minded bride designed her own wedding dress, purchasing a preowned gown and working with a seamstress to make it truly one-of-a-kind. She topped off her bridal ensemble with a yellow rose crown created by Vanessa Schmidt. Audrey's neutral-hued bouquet included garden roses, ranunculus, lavender, and stalks of wheat. Jeremy wore a made-to-measure suit by PROPERSUIT. He had 11 groomsmen, with his brother, Zach Roloff, serving as best man. The groom and groomsmen's ties were made of the same floral material as the bridesmaids' dresses. The ceremony took place at the farm's chapel, decorated with vines and flanked by arrangements of dahlias, hydrangeas, and grasses. Guests sat on hay bales topped with quilts as the couple exchanged personalized vows. Audrey's 12 bridesmaids wore floral dresses by the Lauren Graebner of EVA's by Reclamation and crowns of baby's breath. Before the reception, the newlyweds took to the fields for a few photos. Round tables were topped with lace overlays and lush arrangements of dahlias, hydrangeas, and roses, while the wedding party was seated at a long wooden table decorated with a runner made of fresh blooms, created by Kelly of Blooming Bouquets. Places were set for dinner with mismatched china and glassware. On the menu? Chicken Mirabella (Mirabella is Audrey's middle name! ), polenta, and grilled vegetables. The couple decided to skip the wedding cake, instead serving guests a seasonal selection of berry, peach, and cherry cobblers baked by Mindy of Decadent Creations. Audrey and Jeremy's first dance was to "I Don't Dance" by Lee Brice. The groom danced with his mother, Amy Roloff, to "You Are My Sunshine," a choice with sweet sentimental value. When Jeremy and his twin brother, Zach, were little, that was the song she sang to them as she put them to bed. Audrey and her father danced to "Together At Last" from the musical Annie. She and her father performed the song together when she was in third grade! After the wedding, the pair took off to Jamaica for their honeymoon, where they're enjoying sun and sand. Watch all of these details come to life during Little People, Big World wedding special airing tonight at 10/9c on TLC. Can't wait 'til then? Brides.com has an exclusive sneak peek of Jeremy and Audrey's wedding-planning process — watch it below! Read more: Exclusive: See Little People, Big World's Jeremy Roloff and Audrey Botti's Entire Wedding Album! "And then, one day, it was you." Read more: "And then, one day, it was you."